Favourite food: Braai and any spicy food. Played, coached and later refereed. Serious injuries while playing and still wanting to be involved with top flight rugby. It’s the best seat in the house! Debuts: Currie Cup Premier 2008, SupeRugby 2009, Test Rugby 2011. Grandpa Japie Theron was a Currie Cup ref and later the Secretary of the FS Rugby Union. Dad and brother played and coached. Those in heaven one day. Ref because you love the game and want to help the game grow and improve, not because you want something from it. Business interest – cafe owner, qualified in Law & Accounting, Nashua FS / NC Franchise. 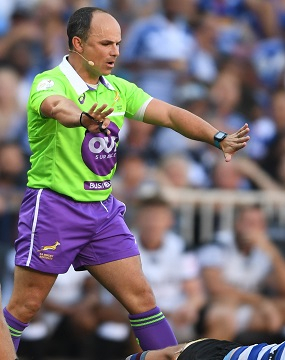 I was the youngest ref at RWC2015… so I am still a junior in referee terms!